On July 5th, UFC middleweight champion Chris Weidman (11-0) will put his title on the line against former light heavyweight champion Lyoto Machida (21-4) in the UFC 175 main event in Las Vegas. Weidman, undefeated, has won seven straight bouts inside the Octagon, including two wins over the man who was considered the top pound-for-pound fighter in the world, Anderson Silva. But is he ready for the elusive and explosive style of “The Dragon”? 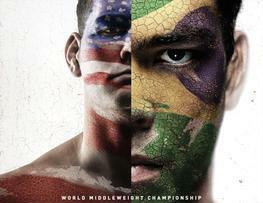 Since dropping to middleweight, Machida has knocked out Mark Munoz and won a dominant decision over Gegard Mousasi. Will he be able to claim another championship belt for himself, or will Weidman finally get that respect?